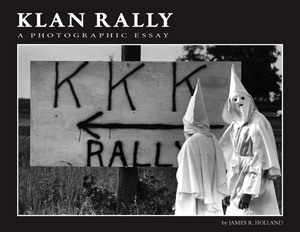 The excellent blog of the Photographic Resource Center at Boston University brings us a reminder of a book that came out in 2008 to great, and well-earned, acclaim, James R. Holland's Klan Rally: A Photographic Essay. Klan Rally won five awards in national book competitions during 2008 and 2009, including recognition as the best book on the history of the United States and best photography book in a competition sponsored by BOOK NEWS/USA. In 2009 it was a finalist in the Eric Hoffer Book Competition in the Art Category. Holland is a Boston-based photographer who took the images in this book when he was a photojournalism student at Ohio University fifty years ago. He never published the images, but went on to a long career as a photographer for National Geographic and as a photojournalist in the Boston area. Holland ran across the images when working on a memoir of his career and recognized their abiding power to show us ourselves at our worst moments. The images in this book were made at a Klan rally in southwestern Ohio but they document one aspect of the tangled and complex legacy of Southern history. The fact that they were not made in the South is also a reminder that Southern history is also American history, that the burden of our legacy of slavery and racial oppression is a national as well as regional burden. UPDATE: This story about recent ceusus data represents some of the best news this Southerner has heard in some time.